Cindy when it comes to death. 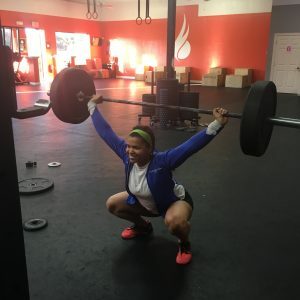 I like the Clean and Jerk but it’s my weakest. I loved that I was crawling away. Compared to when I first started I used to like all the cardio workouts but now I love doing is lifting. The people here and the Saturday Wods are really fun. Compared to other gyms the people here are the best. Do not beat yourself down or compare yourself to other athletes because everyone started where your at now and down the line your get to where they’re at. I saw people doing metcon classes at FGCU and I wanted to try it out. I’m physically stronger and mentally strong has well. My hobbies are yoga and I’m a personal assistant for Capital Wealth Management.